Dr Bernardino Alcázar Navarrete, University of Granada, Granada, Spain Bernardino Alcazar-Navarette is a specialist in Pneumology at the Hospital de Alta Resolución de Loja, Granada, Spain. 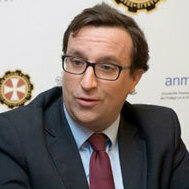 He is also Assistant Professor in the Department of Medicine at the University of Granada. Dr Alcazar-Navarette’s research interests include biomarkers of COPD activity, early COPD and biomarkers in Asthma COPD Overlap Syndrome (ACOS). Between 2012 and 2015 he was Chairman of the COPD Assembly and a member of the Executive Committee for the Spanish Respiratory Society (SEPAR). He was also formally a member of the SEPAR COPD Research Committee between 2013 and 2017.